Each Pixar film since Toy Story (1995) has been more beautiful than the last. Usually, the beauty is shown in the technological advances and with Brave this holds true, but there is a deeper level of artistry at work. The trailers and stills from the film were haunting in their beauty. The greens and reds show a life that we haven’t seen in a film since Finding Nemo. As the trailers allude, we can also expect a fantastic story and amazing character development. As with other Pixar films, it looks like Brave will be full of rich family relationships. When my copy of The Art of Brave by Jenny Lerew arrived, I tore into it with some trepidation. I usually shy away from the Art Of… books until after I have seen the film. Spoilers, you know? The Art of Brave, though, was a little too tempting for me not to pick it up. Jenny Lerew is a blogger and animation historian at Blackwing Diaries. She is a Cal Arts graduate, a story artist and has worked at Warner Bros., Amblimation, Turner, Disney and Dreamworks. Like most Art of Books, Jenny follows a standard format looking at the origins of the film’s art and story and how the film evolved into what we see on the screen. What always surprises me is how long these films take to bring to the screen. The first inklings of Brave were actually doodled in 2005 when story artists, concept artists and other Pixarians started working on the film and hashing out ideas. Part of the journey of the book is seeing how the characters evolved as much as the filmmakers. 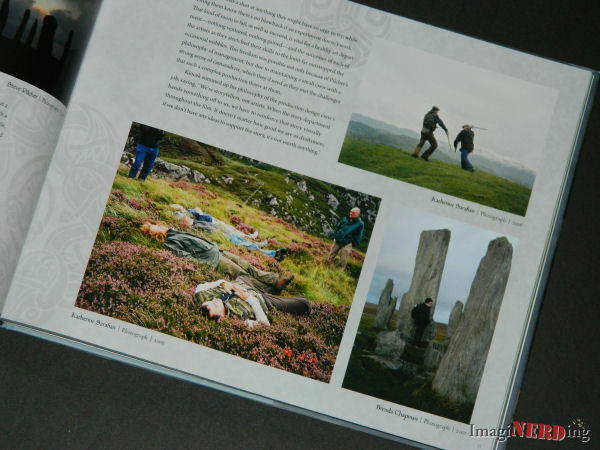 Jenny chronicles the research trip to Scotland that the artists took, which includes pictures of the crew and the inspiration for the background, weather and fauna. 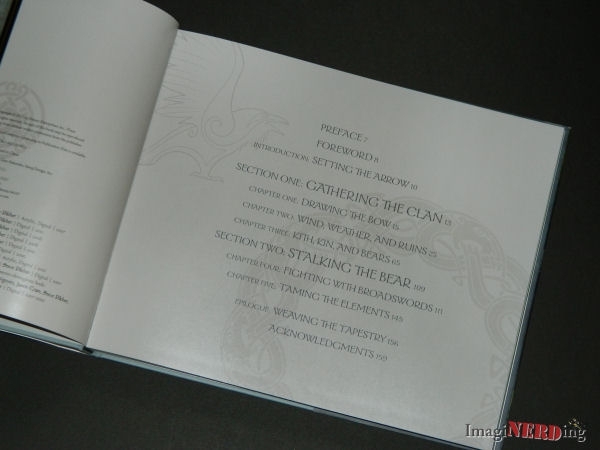 The majority of the book does look at the development of the characters, especially Merida and her family. We learn about the journey of the characters as well as the journey of the artists that created them. As much as Jenny is telling the story of Brave, she is also telling the story of Pixar and the creation of a modern animated film. One of the interesting stories that Jenny relates is how the film mirrors the relationships of several of the producers/directors and their own daughters. Brenda Chapman, the film’s producer, discusses how her daughter had the same “stubbornness, determination, and strength of character” as Merida; it was obviously a heavy influence on the film. 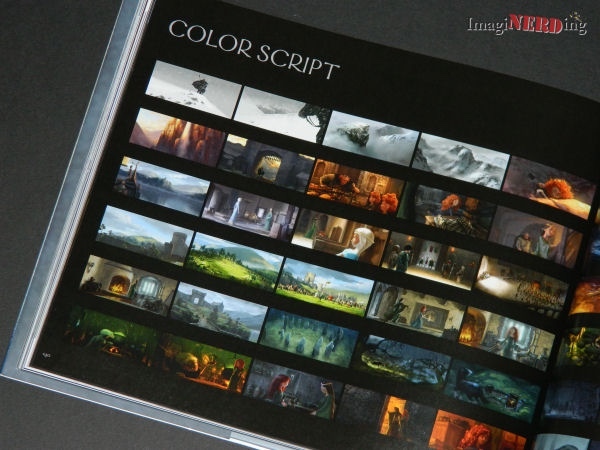 There are astounding images of concept artwork with striking images on almost every page. You really get a great sense of the amount of art that goes into a film, especially the variety of types of art and the types of artists. 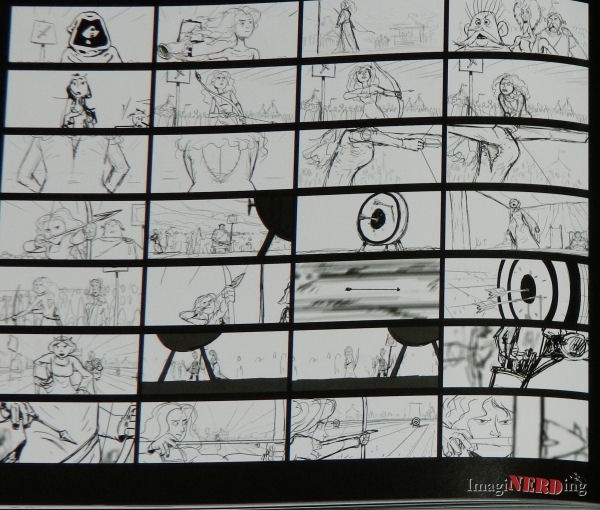 Jenny also includes a lot of the digital storyboards and a color script which looks at the lighting, color, weather and time of day of the film. Pixar is renowned for their color scripts. 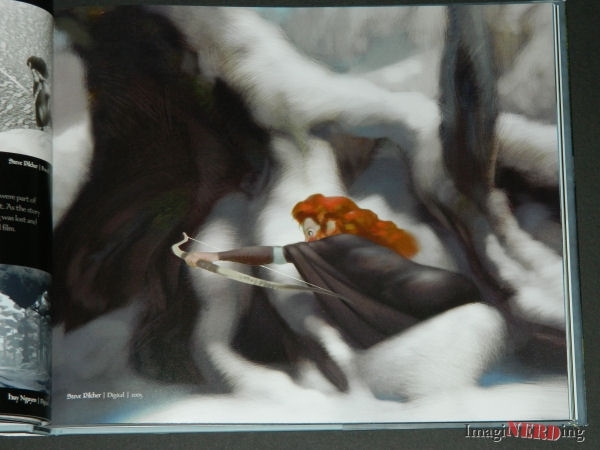 Since I reviewed The Art of Brave before seeing the film, I assumed there would be a few spoilers, but I didn’t see anything that made me less excited about the film. If nothing else, I am convinced that this is going to be the most beautiful and dramatic story that Pixar has ever told. It looks like it is a film that is going to be spectacular on so many levels. As can be expected, this is a book that you have to own if you are a fan of animation. I usually love the Art of… books released by Chronicle Books and give them high marks for the care that is put into reproducing the artwork. 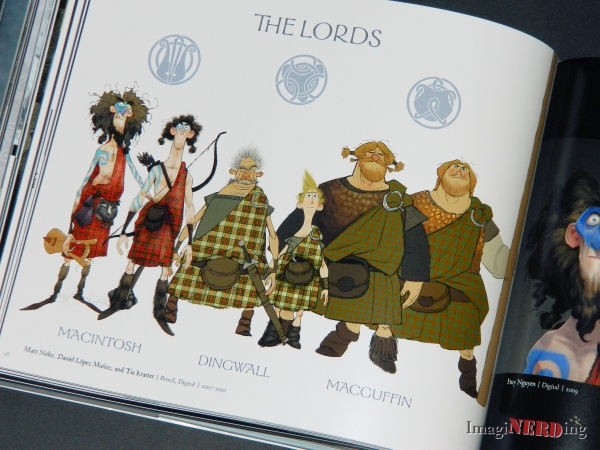 The Art of Brave is no different and the publishers have taken full advantage of the imagery from the film. Jenny’s text is well-written and perceptive. As an animation artist, she brings a special insight into the making of the film and I applaud Chronicle for tapping animators, animation experts and industry specialists to write these titles. Do you collect the Art of… Books? Do you have any favorites? 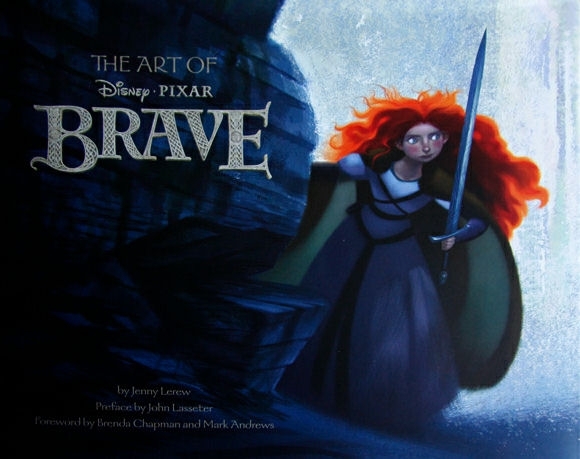 Are you going to add the Art of Brave by Jenny Lerew?